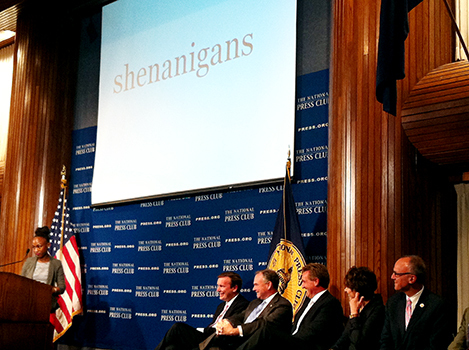 bee after Sen. Jeff Flake (R-Ariz.), third from left, misspells "shenanigans." A politician again captured the title of Best Speller in the United States when Democratic Sen. Tim Kaine of Virginia correctly spelled “nonpareil," defeating Politico’s Rebecca Sinderbrand in the final round of the Centennial Spelling Bee. The event pitted the press against the pols at the National Press Club in Washington. About 400 immigrant detainees are held in solitary confinement on any given day at detention centers around the country, and as we reported in the Workshop’s original investigation, also published in The New York Times, the extended use of such punitive measures can have devastating effects. A new ICE directive issued last week requires facilities to use solitary confinement as a last resort. Read more about the federal oversight and view our new video, which features some of the detainees from our March stories and which includes rare footage inside solitary confinement cells.